The Carrot Ridge (Meacan Buí) is an obvious nose of rock rising from Gleninagh towards Bencorrbeg. It is graded diff. and is 275m long. Tim Robinson's remark that the English name is a mistranslation is, uncharacteristically, off the mark. In fact it is a climber's name rather than a local name. It was named the Carrot Ridge by Joss Lynam and Liam Ó Réagain who believed they were completing the first ascent in the 1949. (In fact, they later learned that some Cambridge students had already climbed it in 1933.) Joss asked Liam what the Irish for carrot was, and Liam replied meacan buí. This is a perfectly good translation for the Eng. word 'carrot' and is listed in Dinneen's Dictionary. Bencorrbeg is the 343rd highest place in Ireland. 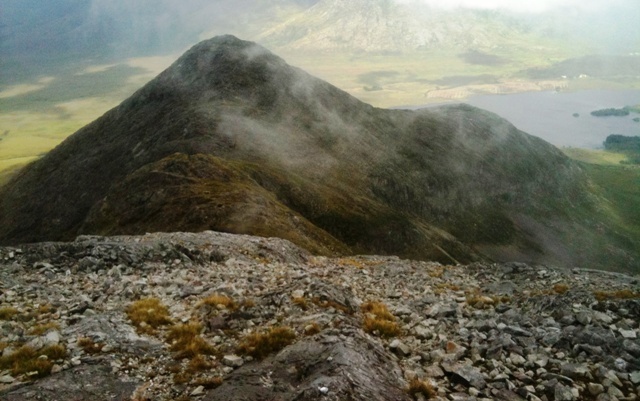 Bencorrbeg is the most easterly summit in the Twelve Bens area. I had spent some time reading the comments of others about these summits – in particular I wanted to know if I could complete a circuit that involved descending Bencorrbeg to bring me back to the farmhouse at L81600 55500 B. (The family here are always willing to let folk park in their yard and if you walk alone like me it’s a good idea to ‘check in’ and ‘check out’ with them – on this occasion the lady of the house told me she had begun looking out for me as it was past 7pm). Reading previous posts by Captain Vertigo, csd, aidand & smcbr I realised that such a descent would require care & some light scrambling.